Computing devices have come a long way over the last years. The modern family now has become mobile in the sense that now they have smartphones, tablets and various other gadgets with rich networking capabilities. Now, it's easy for them to do home networking and remote access a computer with IP address. Home networking could be totally possible if you know how to configure your home router and other devices for you to be able to remote access a computer with IP address. To do that, there are a few things that you need to understand, including WAN(Wide Area Network), LAN (Local Area Network), DNS(Domain Name System) and many else. While all of this might seem overwhelming and too technical, it is quite easy if you are familiar with the router's Web interface. Just make sure to have a good backup of the settings before making any changes. For you to be able to successfully remote access a computer with IP address, it is great to know some of the basic concepts involving home networking. Most of the internet providers supply their subscribers with devices that combine the functionality of a router and modem in a single pack. The router acts as the gateway that allows you to connect multiple devices to a network, while the modern establishes a connection to the internet. 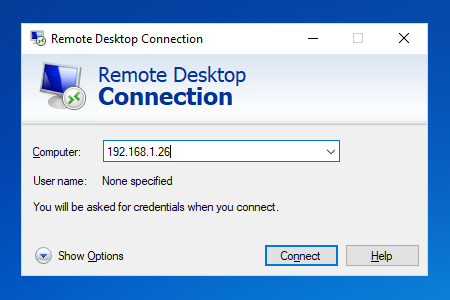 This is very vital if you want to remote access a computer with IP address successfully. There are three options when you want to setup a home network and be able to remote access a computer with IP address. With a wired type of network, you are using Ethernet cables into a network adapters to establish a connection. Although it lack mobility and generally suited for desktops, they do have their advantages. Since they provide a direct type of connection, wired network are able to transfer data faster and more stable. It also provide considerably better security among others and is best when you remote access a computer with IP address. Wireless technology excels in mobility and convenience. However, it is essentially a compromise in terms of performance, security and reliability. The number of devices, obstruction-free router and proper use of security protocols are vital when deploying a wireless network. You have to make sure, you have established your security well before you remote access a computer with IP address. This is more popular nowadays. With this type of connection, you need to plug a special receiver into your wall outlet, which connects to and communicates with your networked devices over an encrypted signal. It is also good if you remote access a computer with IP address. This method doesn't add any additional costs to utility bills and offers a degree of reliability that is somewhere between wired and wireless networking. It is possible to connect far more than desktop and laptop computers to a network. Same goes with remote access a computer with IP address. Printers, network storage devices and a host of mobile gadgets, they can all be connected to the network. In most cases, your devices will have to be manually configured. Your configuration will depend on the operating system running on your central networking computer. Establishing your network is typically a matter of connecting the devices you want to integrate to your router. It may require cables depending on the device. Wireless products come equipped with built-in Wi-Fi capabilities that eliminate the need to build any physical wires. With all the setup you have made, the last thing you need to do before you remote access a computer with IP address is make sure you have a data and network protection like Comodo Internet Security Software that gives you complete protection against viruses and any type of attacks. Building a network in your home has lots of challenges, but the benefits of it outweigh the negatives. You should pay attention to all essentials, and you will be reaping the perks of your own home-based network.